These are the free books I got from Kellogg's. How did I get them? By just simply buying their products that my family likes and looked for the codes inside the box. The codes can then be entered into their Kellogg's Family Rewards web site where you can earn points and redeem it for items your points will allow you. When I got enough points, I went to the redeem section and found these books. 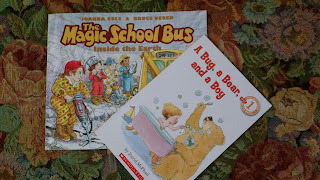 My kids love The Magic School bus show and upon seeing the book, I didn't think twice. The second book was just my choice, I think it's a good bed time book for my 5 yr old son. What I love about Kellogg's Rewards is that they have a program called Points with Purpose and Points for Potential. It allows you to redeem points for money and donate it to charities or school/s of your choice. So don't just throw your Kellogg's boxes away. Look for codes and you can make a difference by helping others. I redeemed 6 books already sis, love this program. This is a nice promo from kellogg's which helps promote their product and for the consumers to learn more about them. That's a nice program. If we have that here in the Phils, I'll surely be looking for those codes too. That's an awesome program that Kellogg's undertake. Is this only in the US or worldwide? This is the first time I have heard about that kind of program and it's very nice for the company to do some charitable stuff for the community.